"It was August 2009, and I decided that Benny needed a playmate. Everyone I spoke with said, 'It’s best to have two cats because they can use the companionship.' By this time, I was very educated about cats and kittens. Again, I was not going to experience what I did with Salem, my first cat who was feral. I was living in a brand new apartment complex which allowed residents to have a maximum of two pets. The apartment was bigger and perfect for two cats. "I learned about the Arizona Humane Society and decided to drive to the South Mountain facility, located on W. Dobbins Road in Phoenix, Arizona. I couldn’t believe how packed it was. I was approached by a 'cat' adoptions counselor and told her I wasn’t sure if I wanted to adopt a kitten. I explained that Benny was a year and a few months. She helped me decide that a kitten wasn’t in my or Benny’s best interest. 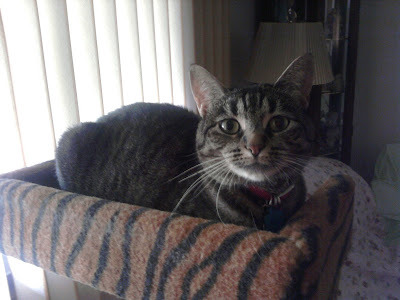 "I looked at the cats in the kitty 'casitas,' and a female brown tabby named CiCi, whose name is now spelled CeCe, caught my eye. The adoptions counselor took CeCe out of her casita and placed us in one of the adoptions rooms. CeCe was very playful and friendly. She rubbed up against me and purred. I knew she was the cat for me and Benny and adopted her on August 9. I didn’t realize until I got home that CeCe came to AHS on August 4, one day before my birthday, which is August 5. Was this a coincidence? Maybe it was. "It took CeCe time to adjust. First, she had a home. Then, she’s surrendered to the Arizona Humane Society. Now, CeCe had a new home and owner who had another cat. Two weeks later, she developed URI [upper respiratory infection], which was another learning experience for me. Since August 2009, she’s experienced a 32-hour road trip and an introduction to a dog. She’s come a long way! "Adopting CeCe made me realize I wanted to help shelter animals. In October 2009, I became a volunteer for the Arizona Humane Society; I loved every minute of it. I began as a dog-walker and transitioned into the Humane Education area, which educates children 7-14 about shelter animals and animals in general. Unfortunately, I had to move away from Arizona in July 2010 but hope to return. Fingers crossed!" She's too cute! Adopting from any animal shelter is a great idea.